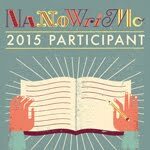 So, this is a story from 2015 NaNoWriMo, or at least it started there. I'm working on polishing it up a bit and will be releasing it as an ebook soon. Edwin Page Glass is a prospector. He travels into the jungles around a village name Meanish Por in hunt for mature yuma trees. These trees are the only place where the Crystal Daggers form. A crystal dagger is beautiful to look at but it is more valuable as they are used in creating logic discs that control the clock work technology of civilization. Edwin has been coming to Meanish Por for more than a decade. Each season he finds enough crystals to keep him coming back, but something keeps getting in the way of great success. The treachery of a partner or their death have made it difficult for Edwin to get ahead and so he came up with a risky and daring plan. Instead of a human partner, this time he is bringing an automation companion. A companion that won't get sick and die leaving a family to claim a portion. Nor one that will even want to be paid at all. And if this works out, he may have taken a great step forward in building a working partnership that will last the rest of his life. Assuming he lives through it. “Blast!” Edwin cursed. “We haven’t bought ourselves as much time as I hoped." They moved out and continued on their path. Most likely the gray and brown prospectors had a map as good as Edwin’s map. They weren’t that hard to get if you could pay for it. The village of Meanish Por had a couple of map makers that made copies and maps for travelers and prospectors. They were also paid by the territorial regulators to map and mark the game preserve on all of their maps. By noon Edwin was exhausted from his forced march and a rapid pace and stopped for lunch. Bread, meat, and cheese washed down with watery ale. A short rest and then back to the trail. “If those two have to travel at about our speed, they won’t be able to catch up for a while.” Edwin said. “Do you expect that they can travel faster?” Betsy asked. “No, I think they won’t catch up today.” Edwin said. “But I am worried about tonight, a bit." “I can travel at night.” Betsy said. “Yes, it's possible to travel at night, but you loose your rest time.” Edwin looked at Betsy. “Well not you, but I would. And this would slow me down the next day." “So they won’t be able to catch up at night.” Betsy said. “Well, that I’m not as sure about.” Edwin continued. “If they don’t plan to travel the next day, then they can loose their sleep and make up for it after they have caught us." “Edwin, I am missing something in this discussion that is worrying you. Can you please explain it to me? What are they trying to catch us for?” Betsy asked. “If I am right, those two are not here to prospect. They are here because they heard you were coming. The crystals you carry inside of you are very valuable and if they stole them, they would make a tidy profit.” Edwin said, voicing his first concern. “And if you are wrong?” Betsy asked. She didn’t show emotion like a person, but she would expressing concern that was built into her workings to protect her ability to function. “If I’m wrong, then they are just claim jumpers and they are planning on taking our maps and supplies and possibly forcing us to harvest crystals for them before they kill us and leave us in the jungle.” Edwin said, voicing the concern he would have is his companion had been and ordinary human. “Are these the only options?” Betsy asked. “The only ones that make sense where a prospector team would chase another team in the jungle.” Edwin said. “Then we must find a way to travel at night.” Betsy said. “I think there might be a better plan than that.” Edwin said. He was working out what he remembered from the last time he had traveled this jungle. And there were other breaks in the trees that weren’t paths. The trick would be how fast Betsy could travel on them.